Up to this point this is the earliest Blue Note in the 1500 series I have on vinyl as an original 1st pressing. 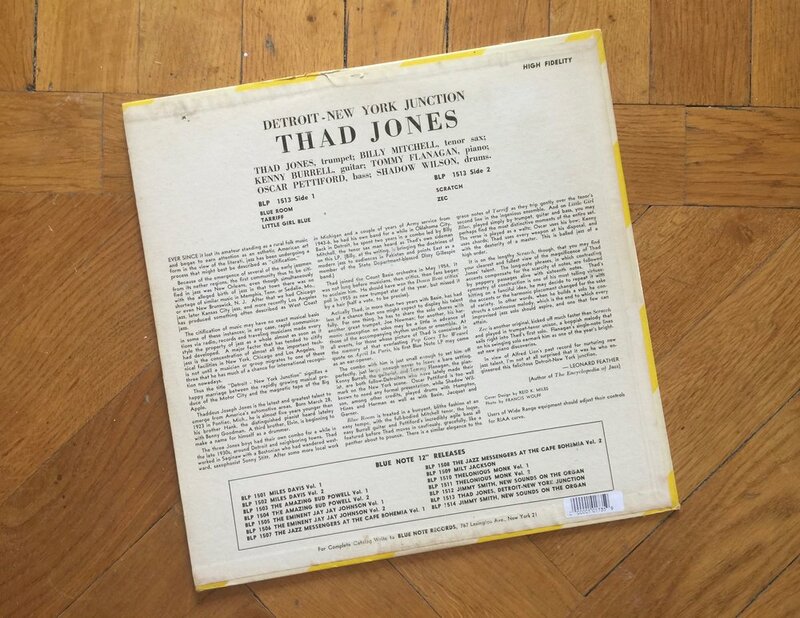 I love Thad Jones. He has a special tone and style. It's a brilliant album, with a old-timey feel. The mix is a bit laid back, not in your face sharp and crystal clear, which I like. It feels very 1950's. One of the few jazz albums I have which features a guitar player. In this case it's Kenny Burrell. I'm not a huge fan of jazz guitar but it's nice from time to time. Burrell is a great jazz guitarist. The drummer is a cat I haven't heard on any other album I have. His name is Rossiere "Shadow" Wilson. According to what I've read his nickname came from "his beautiful light touch with brushes", in the words of bassist Peter Ind. The music is very nice and smooth on this one. A very relaxing album, even on the more up-tempo stuff. It just flows nice from tune to tune, with a nice mix of tempos throughout. You know right from the start of the first tune and the first few bars that this album is going to be a sweet experience. Favorite tunes are "Blue Room", "Tariff" and "Scratch". For me, very smooth and soothing jazz, despite the tunes not all being ballads. This particular album is quite hard to find with all the right attributes, on especially the jacket, with Thad facing the right way and the frame construction. I love these old Lexington Ave. pressings. I only have a few so I'm looking for a lot more of them. I hope I can add a few more before long. Anyway, the BLP 1513 is a great addition to any jazz collection. Highly recommended. Right now I'm in a pleasant situation with a nice dilemma on my hands. Cause I have some money to spend on one or two gems. But I have several different options to buy some amazing original LP's, and I'm not sure which I should buy first. A luxury problem, I know. I think it's important that I choose the right stuff though, cause who knows how long these LP's will be within my reach, and who knows how long I will be in the position to save up for them. I need to focus on the one's that are essential for me. I think I have an idea, but I need to cement that thought and get to work. So, it would be great to hear what you guys think of this Thad album, and maybe which Lexington Ave. era album is your favorite? Stay tuned for more original 1st pressings from my collection. Have a great rest of the weekend folks. Cheerio.